The vision of the AbCF is to catalyse life-changing, community prosperity through carbon farming. In doing this, our aim is to build wealth for Traditional Owners with social, cultural environmental and economic core-benefits through the ethical trade of carbon credits with Corporate Australia, government agencies and international bodies. To meet this vision, Aboriginal Carbon Fund was established in 2010 as a not-for-profit company limited by guarantee. This followed a scoping report developed by Centrefarm Aboriginal Horticulture Limited and a regional forum in Alice Springs, Northern Territory. The founding Directors were Kumantjayi Tilmouth, David Ross and Allan Cooney. The 100% Indigenous staff are passionate about working to build viable economies on Aboriginal lands. We are supported by a range of associates and project partners who are equally committed to supporting indigenous people. The AbCF has a strong culture innovation and collaboration. It takes risks and spends a lot of time on R&D developing carbon products and services that benefit Indigenous people and address climate change nationally and internationally. 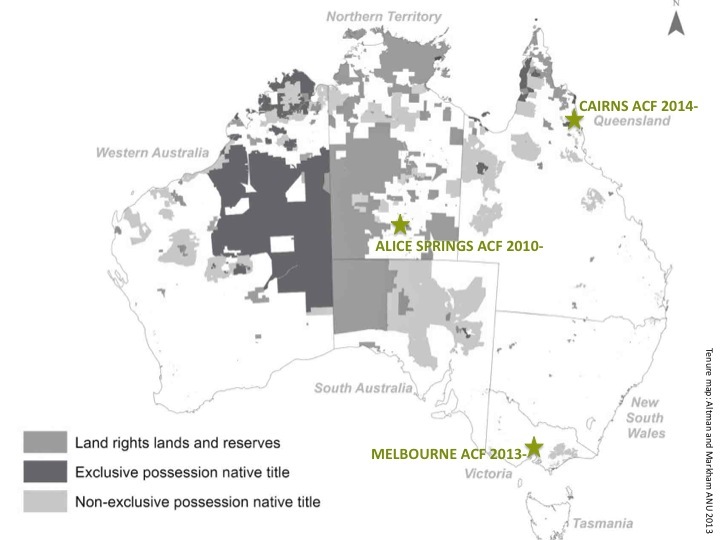 The AbCF openly seeks to collaborate with fellow Aboriginal organisations, carbon companies, NGOs, conservation organisations, universities and government agencies. The AbCF operates on the cutting edge of ideas and community based solutions. It brings together people with fresh ideas, professional experience and a desire to achieve outcomes that tackle indigenous poverty and climate change through a strengths based approach. We have a national presence with offices in Alice Springs, Cairns and Sydney. We are a full member of industry peak body the Carbon Market Institute. Read on about our people and why Aboriginal Carbon Fund is a trusted leader on Aboriginal carbon.